An 11-year-old boy who survived a BB gunshot to the brain said he plans to frame the projectile that nearly cost him his life. Dominic Morado was target shooting with some friends two weeks ago when he was accidentally shot by one of the boys as they slid down a hill. The BB hit Morado just above the right eye, went through his skull, through his brain, and lodged near the back of the skull by the left ear. Morado told Early Show co-anchor Julie Chen Monday that he initially thought he hit his head on a rock and continued walking home after the accidental shooting. But when he fainted before reaching his house, he was taken to the emergency room. Dominic said from that point forward, he could not remember much about the incident. Doctors discovered a BB had been shot through his brain. It was a regular, copper-colored BB, and the doctors could see the path the BB left as it passed through his brain. Dominic was flown to Children's Hospital in Denver, where the surgeons first considered leaving the BB where it was, lodged in the skull, but finally decided they had to operate. "There was a little bit of a debate there. There was like a 5 percent chance that the BB would shift and move. 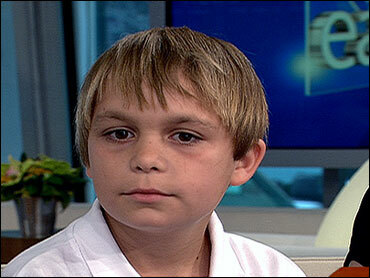 And they didn't want that 5 percent chance to happen," Alicia Eaton, the boy's mother, told CBS' The Early Show. "If it did it would kill him." The doctors cut a small square out of Dominic's skull, repaired the damage to the brain and retrieved the BB. They then used screws to reattach the square piece of skull. "I've never clutched a rosary so hard in my life," Paula Eaton, his grandmother, said about waiting for Dominic to regain consciousness. When he did wake up from surgery, the first thing Dominic asked for was the BB. He wanted the souvenir. The screws will be removed later, and Dominic still has a small, round BB hole scar above his eye. But there appears to be no long-term damage. Doctors told the family the BB didn't hit any vital areas of the brain. He came home from the hospital Sunday, and his family was still concerned about how he would react to the BB and surgery. "Monday, he was climbing trees," his grandmother said. "Looks like he's going to be OK."
BB guns are allowed in Eaton, and the boys were shooting up on a hill away from houses. There will be no charges filed against the boy who accidentally shot Dominic. He said he feels fine, no pain, no dizziness, and his memory is fine now. However, he probably won't return to his fifth-grade class at Benjamin Eaton Elementary School because school ends in a few days. And, according to Grandma, he might not be shooting BB guns for a while. "This should be a lesson to the kids and parents," Eaton said. "You've got to be careful with all guns, even little BB guns."